When to monitor sugar levels? If you are diabetic, you will be taught how to check your blood sugar so that you can monitor and control your diabetes yourself at home. Self-monitoring your blood glucose enables you to act quickly to abnormal levels to prevent the onset and worsening of complications. Your doctor may advise you to keep a diary to spot any trends in your blood sugar levels so that your treatment can be specially tailored to you. 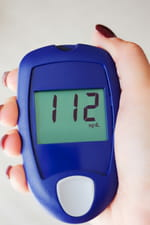 With Type II Diabetes which is not treated with insulin, it is not usually necessary to measure your blood sugar every day, unless the doctor advises to do so. As each patient is different, you will be advised when and how often to check your blood sugar by your GP or diabetic specialist. Two hours after the start of the meal to assess the hyperglycaemic effect of a meal. The blood is collected with a "little" skin prick. The blood is then checked by a small portable monitor. Collection of the drop of blood can cause very mild pain with which you will become familiar. 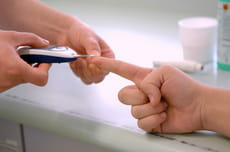 There are several varieties of self-pricking devices, each with a safe method of delivering a tiny "prick" to obtain the one drop of blood needed. The needles will need to be disposed of safely and you will usually be given a sharps box or bin for this. It is advisable to prick the side of the finger. Do not use alcohol or disinfectant. Latest update on July 30, 2010 at 12:05 PM by N.T. This document, titled "Monitoring your Diabetes," is available under the Creative Commons license. Any copy, reuse, or modification of the content should be sufficiently credited to CCM Health (health.ccm.net).